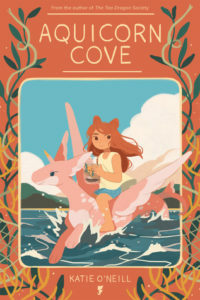 Katie O’Neill’s Aquicorn Cove is an adorably illustrated story about a girl named Lana and her father who return to their little island to visit Auntie Mae. 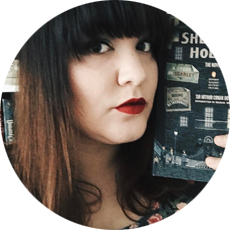 Lana is still grieving the death of her mother, and she finds comfort in the familiarity of the island she used to call home before she moved away to live with her father. The graphic novel follows Lana’s return home and her personal exploration through the island. The story shows the island’s connections with the people, flora, and fauna who live on the island and in the ocean around it and showcases the need to take care of our surroundings, especially our seas and our reefs, and does this through captivating and whimsical illustrations. The story also explores those concepts of care and love for people and our local places and how love manifests its way through different channels. Lana, in her exploration of the islands and the seas around it, discovers that she has to learn how to rely on herself and how to love herself in order to do what needs to be done. This sort of self-discovery is relatable on so many levels, and I felt like the writing was appropriate for all ages, not just for younger readers. I loved it and devoured it in a single sitting, and I found myself wanting to be transported to this island for a visit myself. Thank you to Netgalley and Oni Press for a complimentary digital review copy! All opinions are my own. After reading The Seven Husbands of Evelyn Hugo, Evidence of the Affair, and now Daisy Jones & the Six, I’m convinced that Taylor Jenkins Reid’s writing is absolutely magic, and I found myself wishing that there really was a real Evelyn Hugo and a real Daisy Jones & the Six. I think in 2019 I’m going to read the rest of her backlist titles, because I think TJR is deserving of the buzz that’s surrounded her over the last several years! Daisy Jones & the Six is structured in the form of interview responses, broken up in sections of the band’s history, and at first I thought this was a little slow at the start, but once the story started developing beyond introductions, I loved the different perspectives of everyone in the band happening all at once as the story is pieced together through snippets of interviews given by the band members. It’s a little confusing at first, but then the story really finds its rhythm. What do you do when you find a creative soulmate that might actually be more? How do you reconcile that creative spark with someone who drives you crazy? Daisy and Billy’s connection throughout this entire story is an electric charge that eventually becomes undeniable and unavoidable, and through these interviews and eras of the band’s existence, we get to see how it affects them and everyone around them until the band’s split at the height of their career. One thing I’ve loved about Taylor Jenkins Reid’s writing in the two books I’ve read by her is that it makes you feel something, creates a world in which her characters exist that feels absolutely real, and makes you care about the characters she writes. I wished Evelyn Hugo was real while reading The Seven Husbands of Evelyn Hugo, and I wished Daisy and Billy and the band and their tumultuous relationships with each other were real. 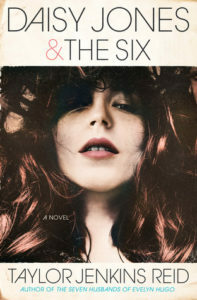 Daisy Jones & the Six comes out March 5, 2019, and you’re definitely going to want to add this to your TBRs! A complimentary copy was sent to me by BookSparks and Ballantine Books for review; all opinions are my own. Since antiquity, people have been asking themselves what it means to live a good life. How should I live? What constitutes a good life? What's the role of fate? What's the role of money? Is leading a good life a question of mindset, or is it more about reaching your goals? Is it better to actively seek happiness or to avoid unhappiness? Each generation poses these questions anew, and somehow the answers are always fundamentally disappointing. Why? Because we're constantly searching for a single principle, a single tenet, a single rule. Yet this holy grail -- a single, simple path to happiness -- doesn't exist. 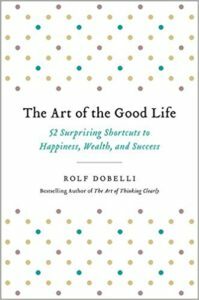 Rolf Dobelli -- successful businessman, founder of the TED-style ideas conference Zurich Minds, bestselling author, and all-around seeker of big ideas -- has made finding a shortcut to happiness his life's mission. He's synthesized the leading thinkers and the latest science in happiness to find the best shortcuts to satisfaction in THE ART OF THE GOOD LIFE, his follow up to the international bestseller The Art of Thinking Clearly (which has sold more than 2.5 million copies in 40 languages all around the globe). THE ART OF THE GOOD LIFE is a toolkit designed for practical living. Here you'll find fifty-two happiness hacks - from guilt-free shunning of technology to gleefully paying your parking tickets - that are certain to optimize your happiness. These tips may not guarantee you a good life, but they'll give you a better chance (and that's all any of us can ask for). 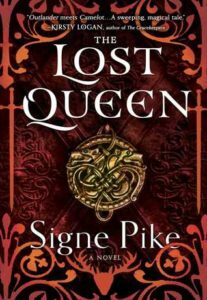 For the most part, I liked this book. I don’t think it’s ultimately got anything life-changing in it. However, I do think it serves as a good reminder in how to think about what you want in your own “good life.” Not every self-help book is going to be the cure, but I think if you read them critically and think of ways to apply someone else’s thought processes to your own life, you might make your own discoveries. I read it in short bursts over lunch breaks over the course of a week, and I think it’s best read in little bits rather than all at once. In fifty-two essays, Rolf Dobelli tells us how to live a good life. The essays focused a lot on modesty, on not being overly flashy, that the “mediocre” is often okay. Some of it I agreed with, some of it I was ambivalent towards, and some I disagreed with. The bits about saving and not overspending and overextending yourself I agreed with. We all have a limited resource of time, focus, and energy, and we should be mindful of where we spend those resources. However, when it came to the subject of giving back to the community, Dobelli suggests that it’s better to just throw money at it and not worry about it otherwise. Living the “good life” to me is not about throwing money at something and forgetting it exists. If I can donate some energy and time to making someone else’s life a little bit better, I feel like I’d get much more out of it than just by donating money. Granted, some of the examples he gave were giving money rather than volunteer tourism, but what about in your local community? The examples Dobelli gave sometimes felt like he’d rather hole himself up inside and not communicate with other people because it’s too exhausting. For me, I think one of the key points of a good life is the relationships and connections you build with other people and your community. The best ideas out of this book that I needed to be reminded of is the circle of competence (doing what you’re good at), the five-second no (because saying yes all the time is not always a good thing), and a circle of dignity (your foundation, essentially). I know I can devote myself to being good at a lot of things, but I would ultimately rather focus my skills and attention on being great at a few things. Saying no and saying yes without a second thought will ultimately give you more work and stress than you’re expecting, so it’s good to take a few moments to consider it and give a response that’s true to you and your foundation. And you can’t have a foundation until you’ve lived a little, lost a little, and experienced the world in real time. I enjoyed the afterword a lot, too, as it made the entire thing a little more personal to Dobelli. If you’re looking for a bite-sized pick-me-up based on research and using real-life examples, you might enjoy what you find in here! Thank you to Hachette for sending me a complimentary copy to review! It comes as no surprise to anyone that Victoria Schwab is one of my favorite writers of all time. Her Shades of Magic trilogy is one of my all-time favorite fantasy series, and her YA fantasies — The Monsters of Verity duology and the Archived series — are complex and SO GOOD. When she announced City of Ghosts, I immediately preordered it and couldn’t wait to have it in my hands. City of Ghosts follows Cassidy Blake’s and her parents’ move to Edinburgh, Scotland, to begin filming a television show (The Inspectres) episode centered on the ghostly activities in old places within Edinburgh. Cassidy has a ghost-friend named Jacob and I loved their interactions, because there’s a lot of spooky in Jacob’s existence. I also want to know Jacob’s history. How did he die? Why did he decide to choose to save Cassidy?? I also enjoyed Cassidy’s friendship with Lara, and I hope to see that developed further in the future books in the series. I liked that Lara was a little bit of a foil for Cassidy in the sense that Lara is able to do some things that cause Cassidy to rethink her own abilities. I won’t spoil anything for you, though! I read a few pages of this one night, and then I sat down and finished the rest of it in a single sitting. This is just the right amount of scary for younger readers and was just enough spooky for me. In fact, it reminded me a lot thematically and atmospherically of Neil Gaiman’s The Graveyard Book to the extent that I considered City of Ghosts to be a companion series of sorts! 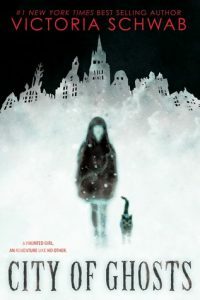 Both City of Ghosts and The Graveyard Book deal with thematic horror of growing up and facing the unknown as we “cross the border” between the innocence of childhood and the awareness and understanding of adulthood. It’s in those in-between times that we really come to know ourselves and what we’re capable of. If you enjoy middle grade fantasy/horror and want to be chilled to the bone in similar ways after reading The Graveyard Book and Coraline, definitely pick this one up!